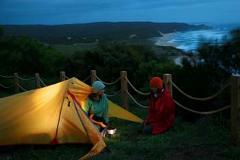 Six Day Assisted Camping on the Great Ocean Walk. Self-guided walk staying in campsites on the Great Ocean Walk. We provide water, move your heavy rucksacks and transfer you from the 12 Apostles back to Apollo Bay at end of your walk. Four Day Assisted Camping on the Great Ocean Walk. Self-guided walk staying in campsites on the Great Ocean Walk. We provide water, move your heavy rucksacks and transfer you from Ryan's Den to Apollo Bay at end of your walk. Three Day Assisted Camping on the Great Ocean Walk. Self-guided walk staying in campsites on the Great Ocean Walk. We provide water, move your heavy rucksacks and transfer you from Johanna to Apollo Bay at end of your walk.